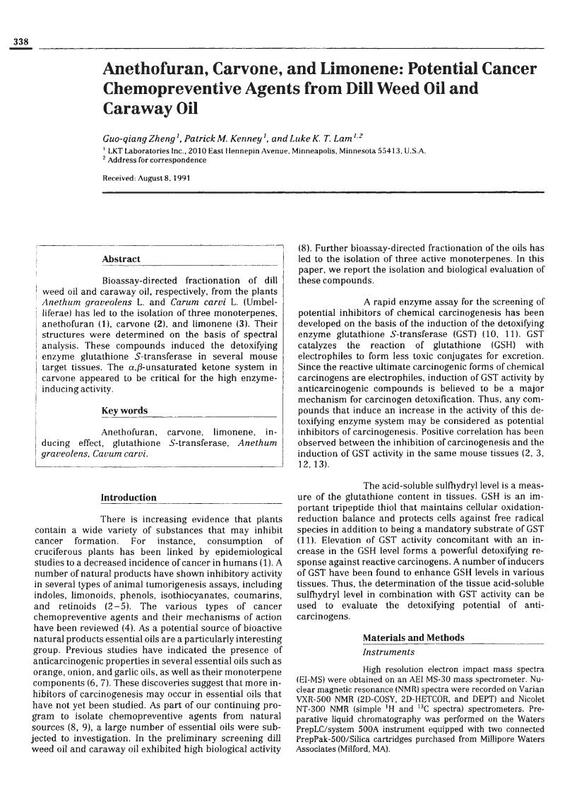 LKT Laboratories Inc., 2010 East Hennepin Avenue, Minneapolis, Minnesota 55413, U.S.A.
Bioassay-directed fractionation of dill weed oil and caraway oil, respectively, from the plants Anethum graveolens L. and Carum carvi L. (Umbelliferae) has led to the isolation of three monoterpenes, anethofuran (1), carvone (2), and limonene (3). Their structures were determined on the basis of spectral analysis. These compounds induced the detoxifying enzyme glutathione S-transferase in several mouse target tissues. The α,β-unsaturated ketone system in carvone appeared to be critical for the high enzyme-inducing activity.